In many company cultures you hear the word "team" often. "Our team is working to improve the process for . . ."
"My team will be on-site to begin the project on Tuesday." "Our team presented the Q4 report at the conference." But what does it really mean to be part of a team in today's workplace? How do you work as a team player? There is an evolution taking place in work environments today. Lines are being blurred in the segmentation of workers. Managers and Directors are becoming Project Leaders. Offices are now open work spaces and conference rooms have glass walls. Transparency is key when working as a team. Each employee - or player - has an assigned role that contributes to the goal of the team. Sounds a little like baseball or football, doesn't it? Understands her role and goals at work are very important, but can put them aside to work for a common goal and aim. Helps others succeed and shares credit for successes. Wants others to feel confident and notices when it’s time to give someone a compliment. Knows and follows the rules. Has an encouraging and positive attitude. Doesn’t hold anyone back by failing to perform duties. When a company department acts as a team, work doesn't stop - the ball doesn't get dropped - just because one player drops out for a time. It's an effective concept, but how does this relate to etiquette? Mere conventions, mere formal ceremonies, do not indicate good manners. 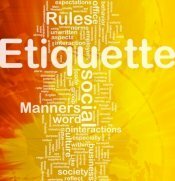 Good manners are the result of an unselfish desire to avoid annoying others and to give pleasure to one’s associates. When you demonstrate and practice etiquette, you place concern for others first in a given situation, while remaining true to yourself. Though carrying through with your assigned roles in a work environment and being polite and courteous is important, it does not qualify you as a team player. A team player takes on the equivalent of hosting roles. That is, regardless of the role you play, you help create an atmosphere of good will. You greet others, make everyone feel welcome, and are observant when it comes to others' needs. You don’t hesitate to share information and help direct when necessary. Do their jobs in a timely and reliable way. Are constant learners, keeping eyes open for other views and ways things might be accomplished. Acknowledge the leadership roles of others. Give feedback at appropriate times. Take turns with office responsibilities. Appreciate and value differences of personality and working styles of other team members. Are attune to the maxim of “live and let live,” never participating in idle gossip and minding other people’s business. Quick to look for and congratulate or affirm their associates on successes. Volunteer to take on extra roles to help the team out and advance shared goals. Employers are looking for people who are capable of working in a cooperative environment. This trend is sure to continue as companies shift toward a more "open" work culture. A productive member of a team earns a good reputation over time. Regardless of the speed at which you advance or succeed in your job, or even move on to other opportunities, the ability to function well in your group will bring positive recognition.